The Euro bears were in complete control last week with 5 consecutive negative days, extending the losses towards 1.1320, despite better than expected German Trade Balance (19.4B vs 18.1B). The latest disappointment came from developments around trade talks. US President Donald Trump said that he would unlikely meet his Chinese President Xi Jinping before March 1st, the deadline imposed by the US to conclude negotiations. The Trump Administration is ready to set new tariffs on China if no accord is reached. Today will be a quiet day in terms of macroeconomic releases, so investors will most likely shift their attention to the trade and Euro-zone growth. The Euro continued its losses on Friday after price retested the 1.1350 (R1) resistance but couldn’t break above it. 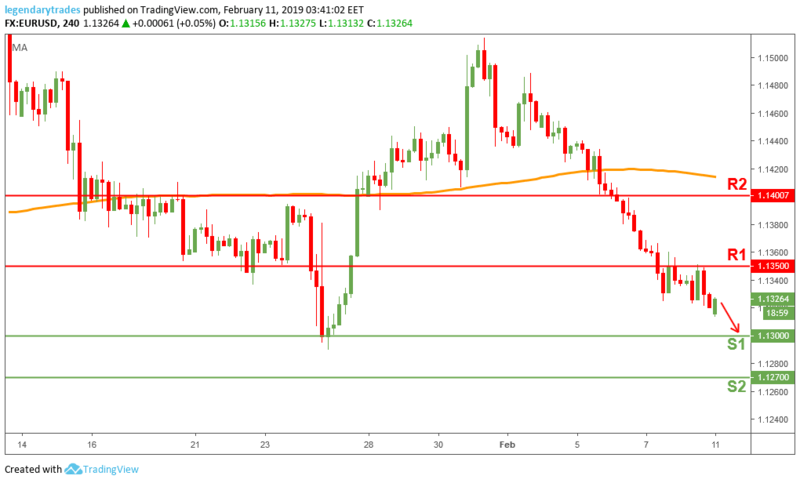 The Single Currency is likely headed to retest 1.13 (S1) support level. If the bears take out that level, we could possibly see further weakness towards 1.1270 (S2). The bulls need to break above 1.1350 to regain control.